The horizontal movement of air from high pressure area to low pressure areas is called wind. The process is like the air near the earth's surface gets heated up due to insolation (the incoming solar radiation), whereas the upper layer is cool and, hence it is denser than warm air. The warm air lifts up due to less denser, goes up and cool air comes down and this process goes on. But, when the warm up goes up, it scatters to fill up the gap near the equator. Thus, this creates a region is known as EQUATORIAL LOW PRESSURE BELT or THE DOLDRUMS. The air near the polar region is very cold. The cold air is heavy and dense. As a result, it piles up there and creates high pressure belt called POLAR HIGH PRESSURE BELT. The rising air near the equator rises up and gets cooled down. It spread out towards the poles and start sinking near 30 degree North and 30 degree South. 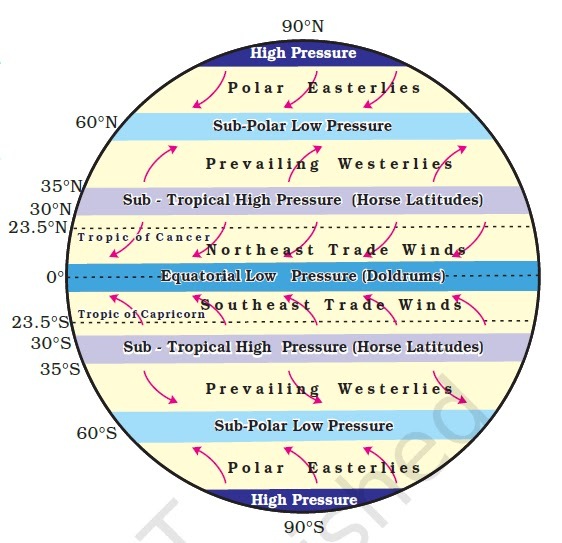 Thus, high pressure belt gets created here and is called SUB-TROPICAL HIGH PRESSURE BELT or THE HORSE LATITUDE. - As, there are two High Pressure belts- Polar and Sub-tropical. The air starts from high pressure belt to low pressure belt and meets at 60 N and 60 S in both hemisphere. - The air at High pressure of Sub-tropical region also moves towards the Low pressure Equator region to fill the gap. 1.Permanent winds – The Trade winds, Westerlies, and Easterlies (Polar wind) are the permanent winds. These blow constantly throughout the year in a particular direction. 2. Seasonal winds – These winds change their direction in different seasons. For example, South-west monsoons in India. 3. Local winds – These blow only during a particular period of the day or year in a small area. For example, land and sea breeze; and Katabatic wind on mountain slopes. It is called loo which is hot, dry and dust wind blows in the northern region of India in May and June. The Mistral is the wind blows from France Alps mountain to Mediterranean sea. - SEA BREEZE and LAND BREEZE is common in coastal areas. As, the land gets heated up quickly during the day and low pressure belt is created, whereas the air near the surface of sea is cool and hence, high pressure belt is created. The air moves from sea to land is called Sea Breeze. The air moves from land to sea in night is called Land Breeze. - The wind blows from Sub-tropical high pressure belt towards equatorial low pressure belt is called TRADE WINDS. It blows in constant direction throughout the year. It blows from North-east direction in the Northern hemisphere, while from South-east direction in the Southern hemisphere. - The WESTERLIES are the wind blowing from Sub-tropical high pressure belts towards the Sub-polar low pressure belt. It blows from the South-west direction in the Northern hemisphere, while from the North-west direction in the Southern hemisphere. - The POLAR EASTERLIES blow from polar high pressure belt towards sub-polar low pressure belt. It blows from North-east in the Northern hemisphere, while from South-east in the Southern hemisphere. Comments "Basic concept of Wind system and its Major Pressure Belts"